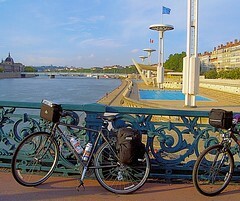 I started my summer cycling trip in the Rhone, so it’s only fair to drink a little now. Domaine Vieux Manoir de Maransan 2004 from Majestic is a blend of Grenache Blanc, Roussane, Viognier and Clairette. That’s a lot of grapes! It’s a rich lemon colour with plenty of fresh fruity aromas. There’s apricots and limes galore on the nose. It’s dry with a refreshing level of acidity, but it’s the fruit that really comes through. More apricots and peaches, with citrus fruits and a touch of something almost like cinnamon. It’s 13% alcohol, but feels quite rich and full bodied with the fruit really hanging around and spice developing on the length. This is a fantastic value wine at around £5. Majestic currently have it on multi-buy for £4.49 and it would make a great change from a supermarket Chardonnay for a cautious wine buyer wanting to dip their toe in the Rhone.